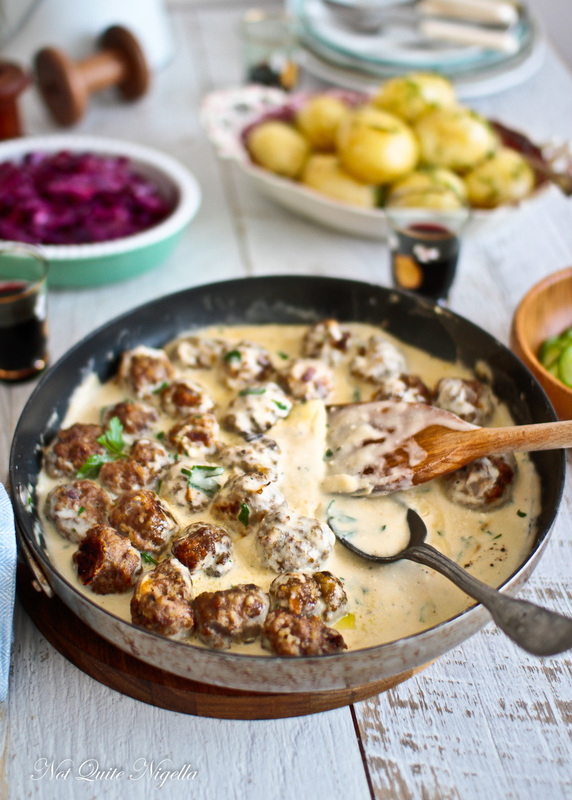 A Mid Winter's Swedish Dinner With Swedish Meatballs & Sides! 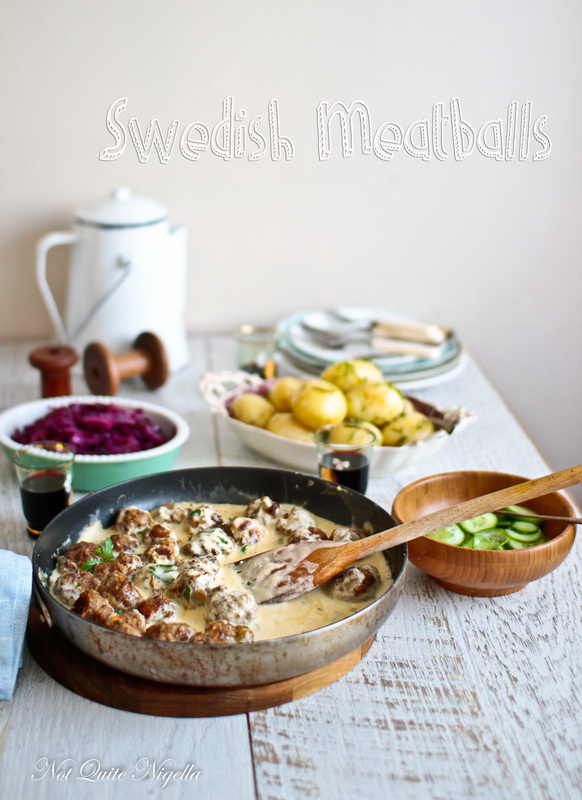 Swedish Meatballs are soft beef and pork meatballs that are bathed in a rich, creamy sauce flavoured with parsley. 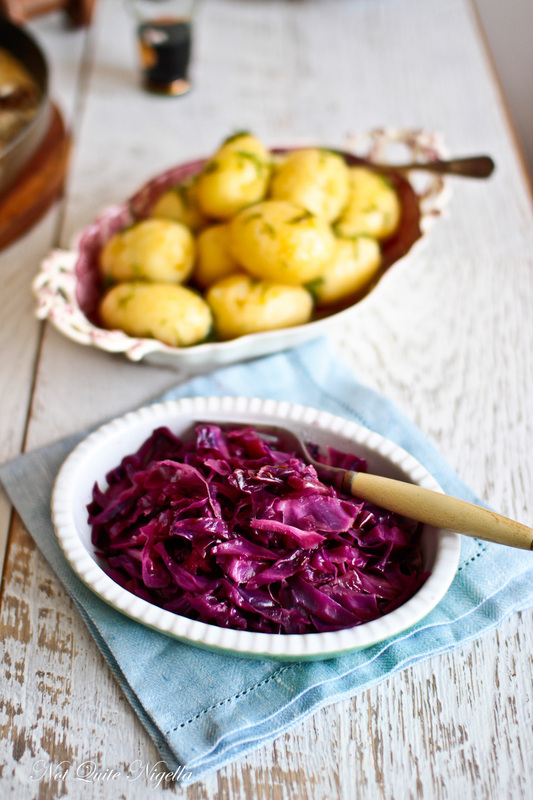 Their best partner is boiled potatoes glazed with dill butter or red cabbage with caraway and apple. 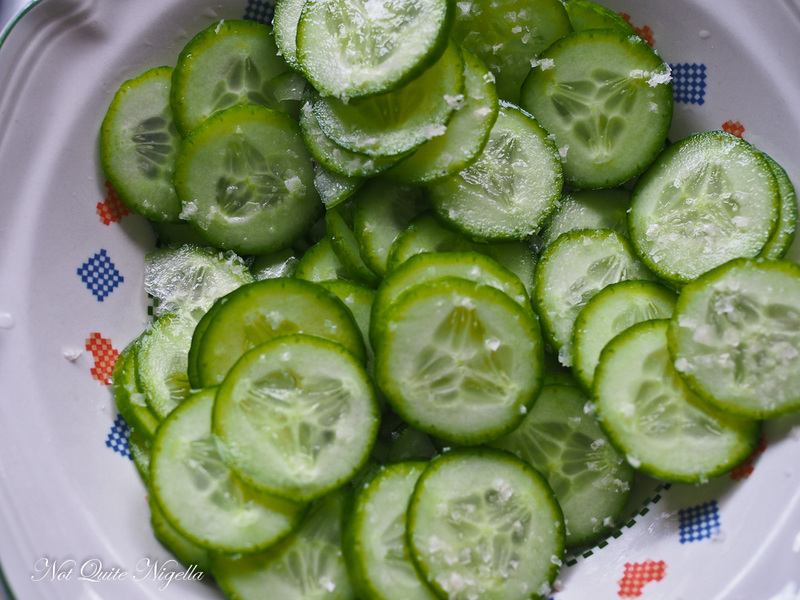 To lighten it all up is a fresh cucumber pickle salad. Who says that Winter has to be dull? Sweden is known for several contributions to the world-be it Ikea, Swedish chef, Swedish meatballs, heroes and really hot men (that last one is really just from watching True Blood and The Killing). And while you get buy bags of frozen Swedish meatballs at Ikea, making a version at home without premade or packet mixes is so, so much more delicious. 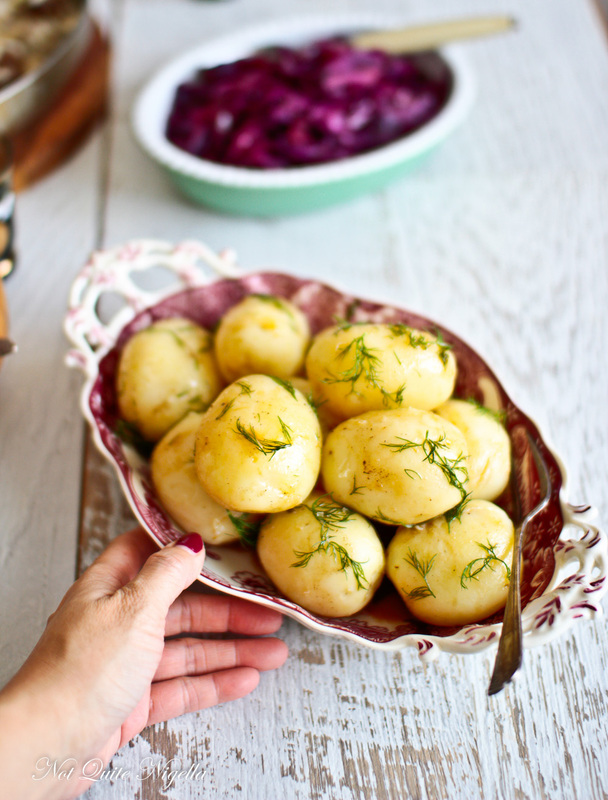 While people often eat meatballs with a side salad or a starch, after pairing the meatballs with glazed potatoes, red cabbage and cucumber pickles, I have to say that these sides are a must. You know how I occasionally get pushy - okay more than occasionally I will get pushy but honestly it's just my way of expressing enthusiasm and I just want you to have something as delicious as I had. And these Dear Reader are three of the best sides you could ever pair with Swedish meatballs. So much so that this became a dinner party meal it was so good. 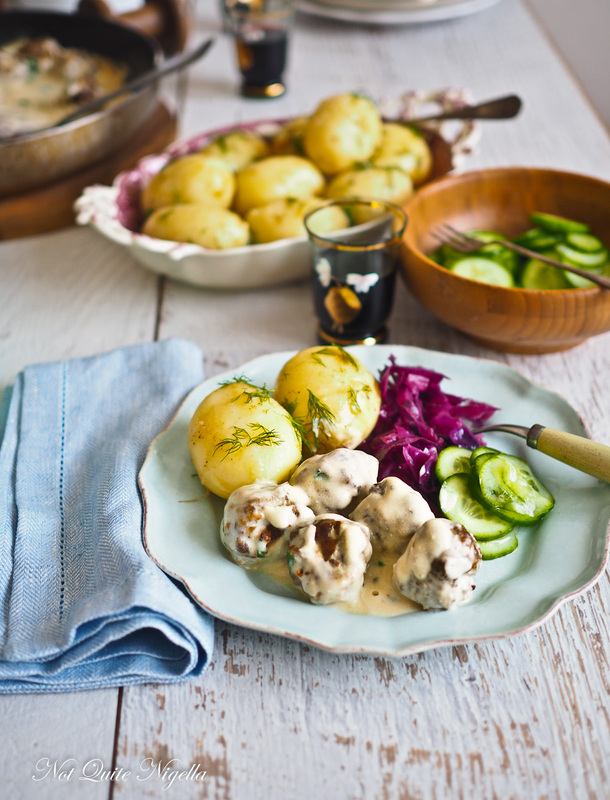 The soft meatballs are covered in a cream sauce and then there's Swedish red cabbage flavoured with spices like caraway seeds and allspice, red wine and sweetened with apple. 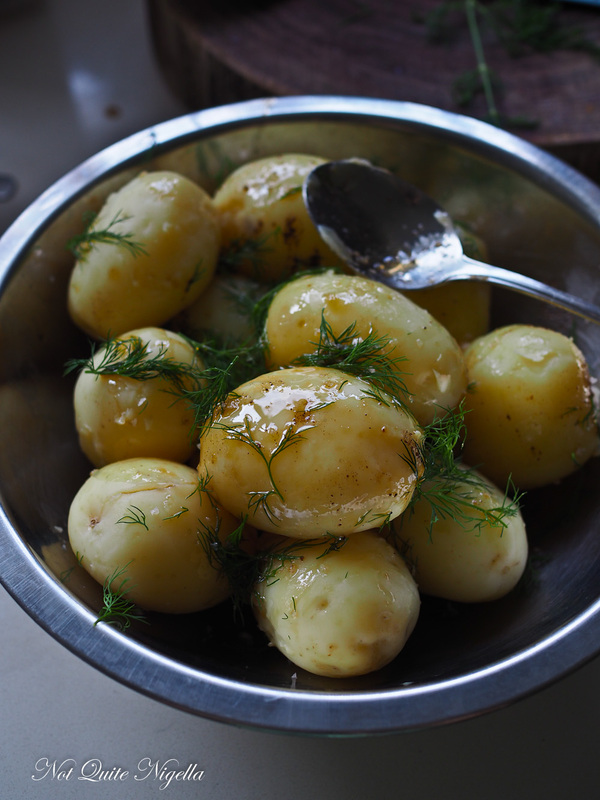 Then boiled potatoes get a new life with a coating of browned butter and fresh dill. And to lighten it up from the rich creaminess and butter there are some fantastic fresh pickles that you can quickly whip up. 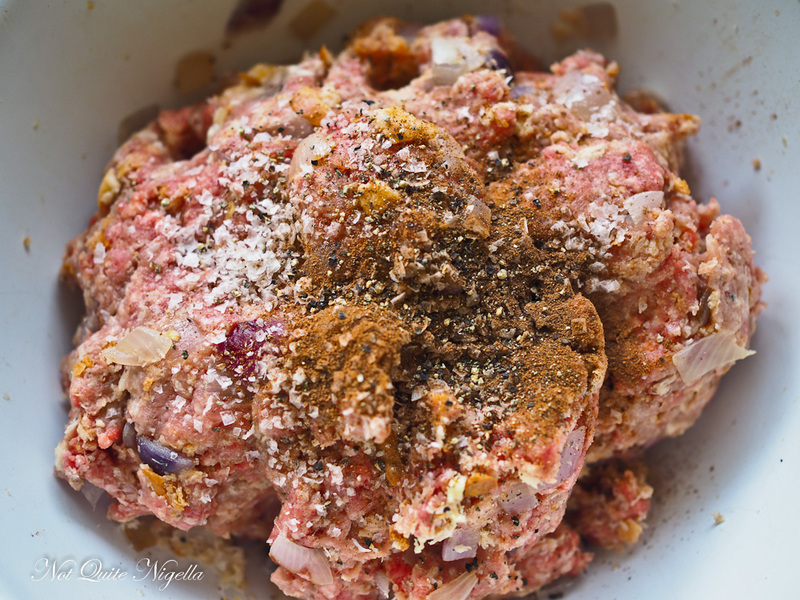 Swedish meatballs were the first recipe I ever made as a sort of grown up kid. It was from a microwave cookbook and the reason why my interest was piqued was because we were fascinated by this thing called a microwave that had just come out. For us, a family that only ate Chinese food, peering into the microwave as a family unit seemed as normal as watching tv. The first savoury dish was one that sounded incredibly exotic to us: Kottbullar or Swedish meatballs. I mean exotic is really based on one's own perspective isn't it? We didn't know anyone from Sweden and it seemed such a distant land. We sent our dad off to the supermarket. My sister had written "Kottbullar" on top of the shopping list along with the rest of the ingredients underneath it like nutmeg and cream and things that we never had in our house. He returned, anxious and unhappy. My poor dad had searched the whole supermarket for Kottbullar. He even went against his hermit instincts and asked someone who merely shook their head and told him that they had never heard of it. And that Dear Reader is when we first fell in love with Swedish meatballs. 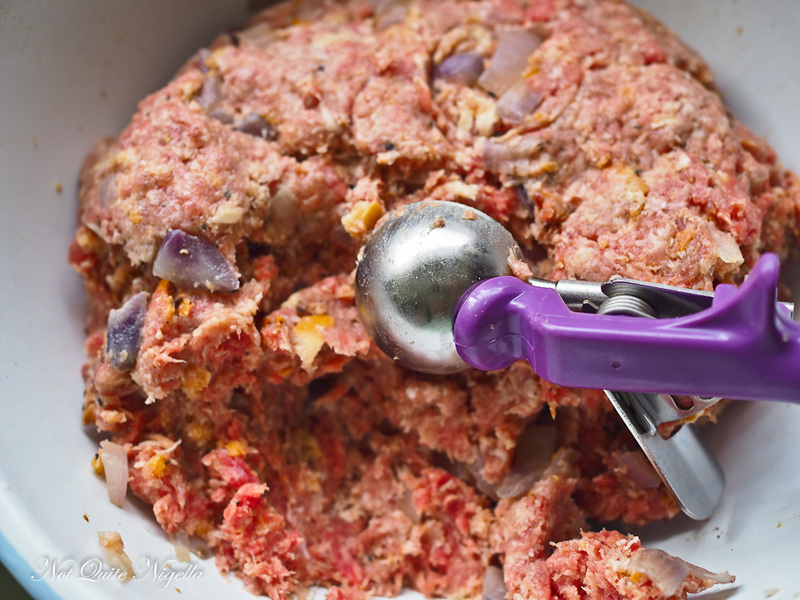 I've rarely met a meatball I don't like and the key to these is the bread in them that lightens them considerably. Instead of a tomato sauce these come with a beef stock flavoured cream sauce with parsley - a ridiculously easy but oh so rewarding sauce. These recipes below do make enough to feed a dinner party of six (or four if they're Vikings). The meatballs are also fabulous stuffed in a crunchy baguette with sauce drizzled over it with the pickles. So tell me Dear Reader, were you fascinated by the microwave as a kid? What was one of the first things you ever cooked? Was it very different from what you grew up eating or was it a family recipe? And what do you think of when you think of Sweden? Step 1 - Preheat oven to 200C/400F and line 2-3 baking trays with parchment. Heat the butter in a frypan and saute the onions until translucent. Allow to cool a little. 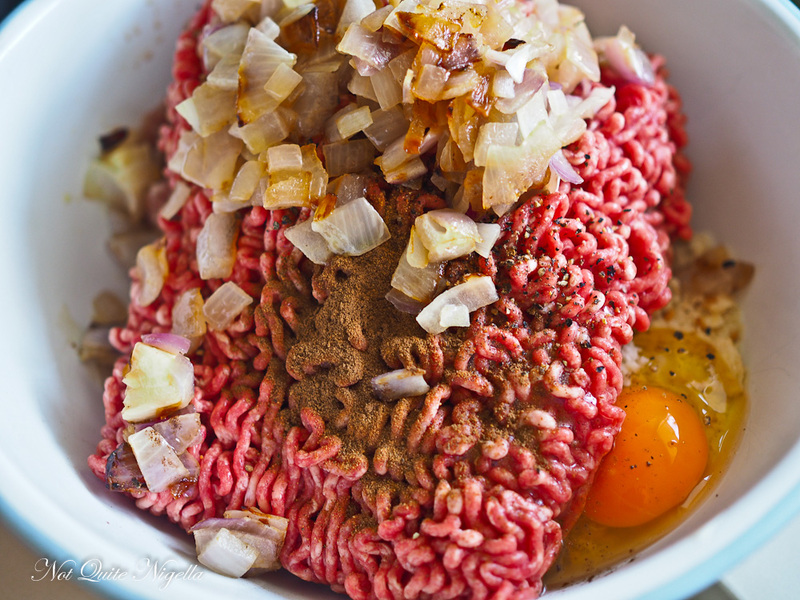 Mix the onions with the two minces, breadcrumbs, egg, milk, nutmeg, allspice, salt and pepper. Step 2 - Shape into small balls. I use a small ice cream scoop (not a regular sized one, that is too big). Place onto lined trays and bake for 18-20 minutes until golden. Step 3 - Meanwhile make the sauce. 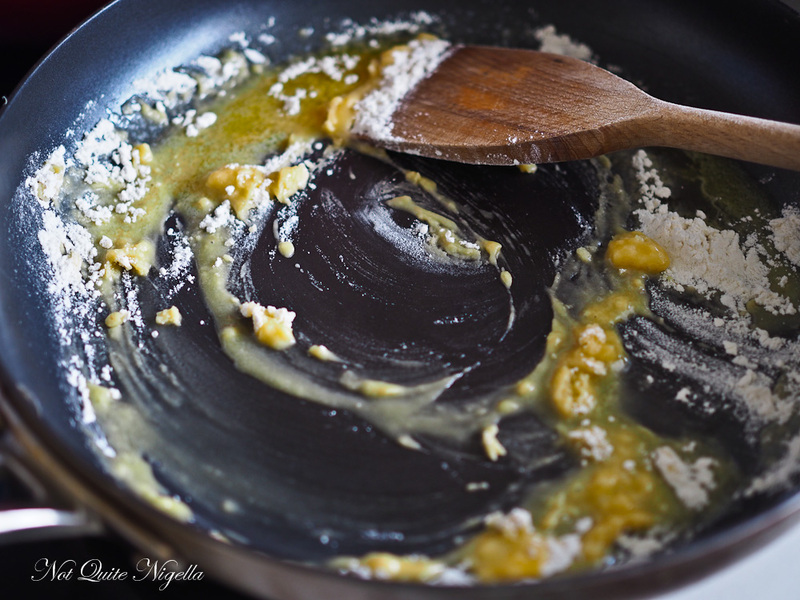 I use the same frypan and melt the butter. Then add the flour and stir to cook it for a minute. Add the hot beef stock in two or three lots and stir to combine. Add the cream and parsley. Season with salt and pepper. 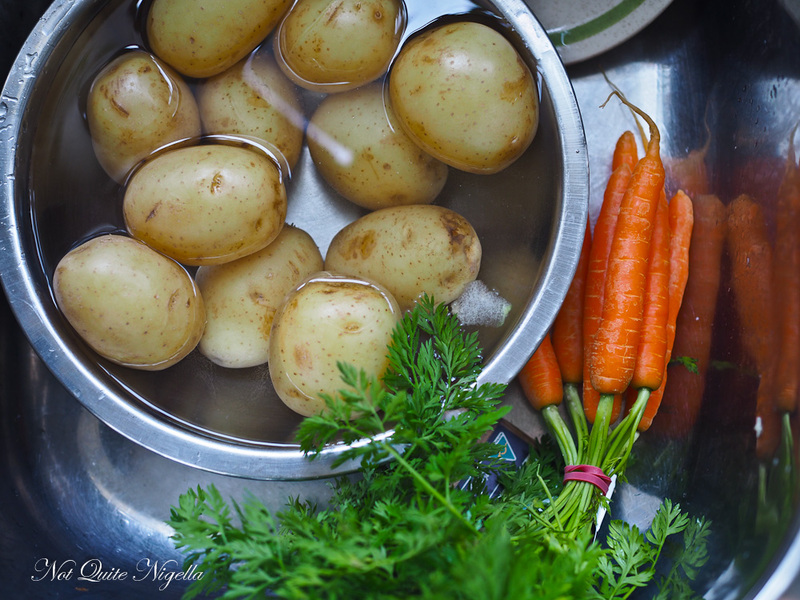 Step 1 - Boil the potatoes in generously salted water until fork tender - about 45 minutes to an hour for medium sized potatoes. Allow to cool and slip the skins off. Heat the butter on a medium high heat and then allow to brown - when it smells nutty it is ready. 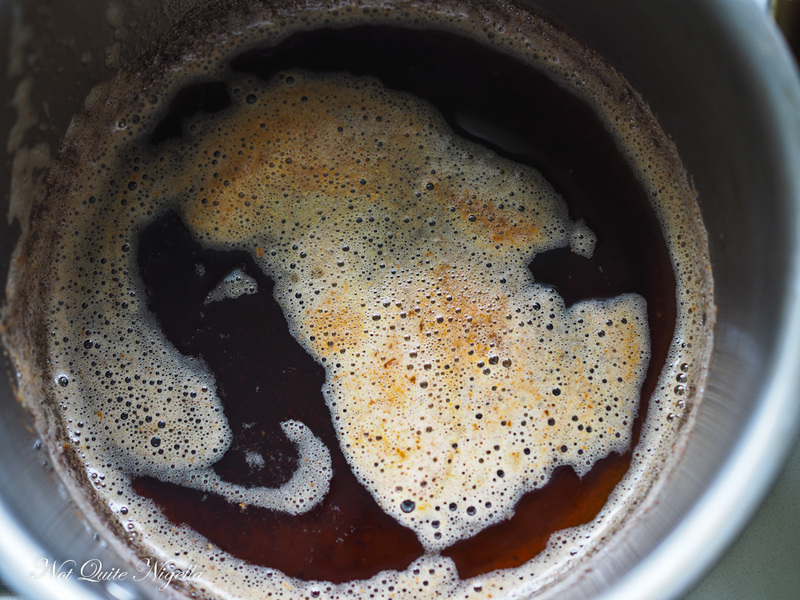 Remove from the heat and skim the foam off the top and use the top layer (leave behind the grainy bits). Toss the potatoes in the golden butter and fresh dill. Tip: you can also roast carrots and use the browned butter and dill to flavour them. Step 1 - Saute the onions in the butter on medium heat for a couple of minutes. 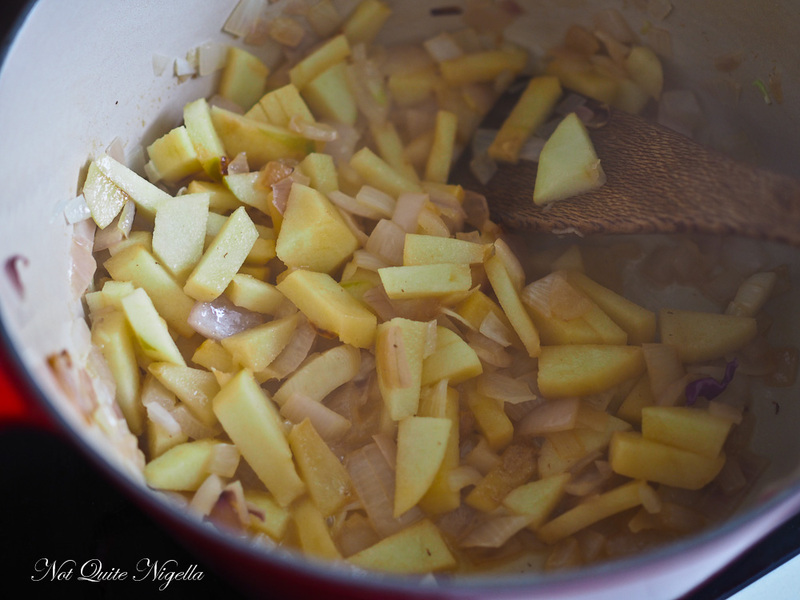 Add the apples and cook for 3 minutes or so. Then add the cabbage and stir and place the lid on for about 10 minutes and cook on medium heat. 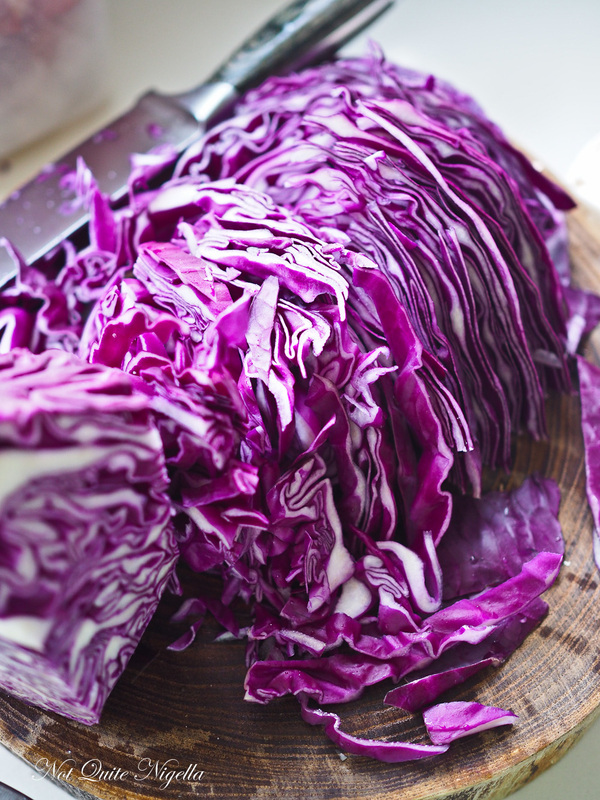 After 10 minutes the cabbage should have softened and wilted. 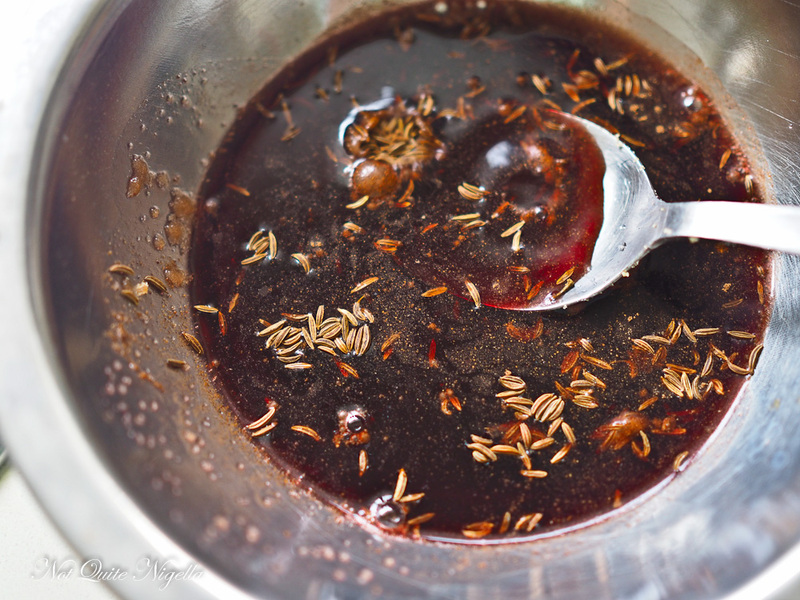 Then add the red wine, brown sugar, vinegar,caraway seeds, allspice and cloves. Cook for another 10 minutes or so until soft. Season with salt and black pepper. Step 1 - Slice the cucumbers as thinly as possible. Add salt on top and allow the excess water to drain out from them in the fridge for 30 minutes. Drain the water and add the vinegar, sugar and dill. recipeDuck Breast with White Cherry Sauce and Golden Duck Fat Hasselback Potatoes! recipe Duck Breast with White Cherry Sauce and Golden Duck Fat Hasselback Potatoes!